Thank you Nature’s Greens for sponsoring this post! We love Nature’s Greens, dark leafy greens. As always, all thoughts and opinions are our own! 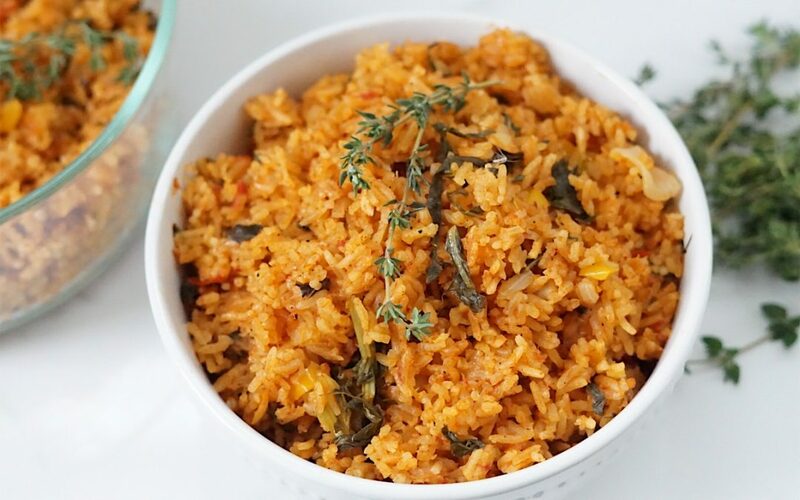 Jollof rice is a one-pot rice dish popular in many West African countries. Each country has its own take on this versatile and delicious food. 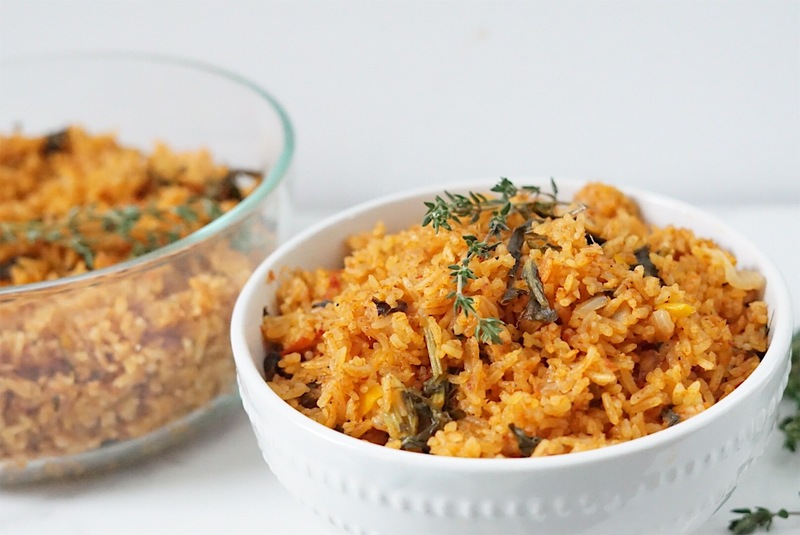 It’s similar to a jambalaya or Spanish rice. So if you like either of those, then you’ll surely fall in love with this recipe. This Spicy Salmon Jollof Rice with Mixed Greens is very nutrient dense, simple, and is the perfect side for any meal. This recipe uses whole ingredients from a variety of food groups making it more balanced and energy-boosting, perfect for a pre or post-workout session meal. Rice is a staple in most homes, and depending on the type of rice you are using, it may not have the highest amounts of nutrition. The main ingredient in this recipe is jasmine rice. Well, jasmine rice has insignificant amounts of vitamin A, C, D, and iron because of how it is processed. The outer hull of the grain, bran and the germ contains most of the nutrients, so when they’re taken out, you are left with white rice. We are believers that all foods fit into a healthful diet, meaning there are always ways to boost nutrition in almost any food. The main ingredients in this recipe include jasmine rice, tomatoes, tomato paste, onions, habanero peppers, salt, spices and vegetable oil. We also incorporated lean salmon and Nature’s Greens, mixed greens to give it a nutrition boost. Salmon is high in protein, omega-3 fatty acids, and vitamin D, while mixed greens such as collards, kale and mustard greens include antioxidants, fiber and plant based protein keeping you well-nourished and satiated. Nature’s Greens have a variety of dark leafy greens, that are pre-washed and ready to be added to any of your favorite dishes such as salads, pastas and even soups! It is preservative free, and has a fresh taste. Its versatility makes it a favorite of ours. It’s important to eat a variety of foods from the different food groups and a variety of foods within each group for overall health and enjoyment. Provide your body with the nutrients it needs. Balance eating for nourishment with eating for enjoyment. You don’t need to be perfect every time you eat because you have the flexibility to adjust your intake from one meal to the next to achieve overall balance. 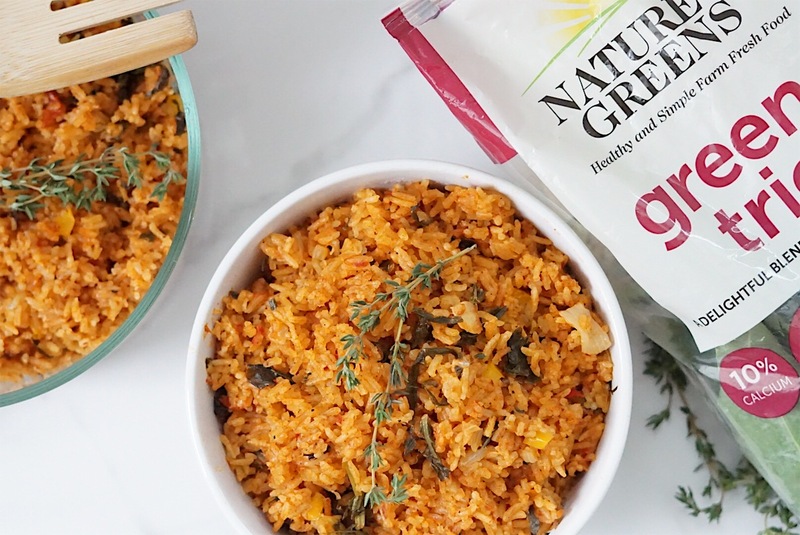 If you’re going to make this delicious, Spicy Salmon Jollof Rice with Mixed Greens, don’t forget to tag flourishheights on social media so I can see your creations! Also, don’t forget to visit Nature’s Greens to learn more about their fresh nature leafy greens and delicious recipes. Turn on your stove, set to medium-high. In a large pot, add olive oil. When oil is hot, add onions, ½ fresh tomatoes, curry powder, paprika. Then stir for about 2 minutes until light golden brown color. In blender, add ½ fresh tomatoes, onions, garlic, ginger, habernero pepper. Blend until pureed consistency. Pour the purée into the pot, add in bay leaves, tomato paste and seasonings of choice. Stir, and cover for about 15 to 20 minutes on medium heat until tomato stew is cooked and there is a dark red color with oil floating at the top of sauce. Add canned salmon, and bell peppers. Stir gently. Add rice into the pot. Stir every very few minutes, reducing the heat to low. Add in Nature’s Greens pre-washed mixed greens trio. Cover pot and let cook until rice is al dente, about 45 minutes. Tip: After 25-30 minutes, check; if rice is too saucy, remove the lid to cook off the excess sauce. If too dry, add 1 to 2 cups water and stir.